Annual Mouth Cancer Screening Tests are now available at the De La Warr Dental Surgery! The NHS/BDA have endorsed and also recommended that you have this test (once per year). 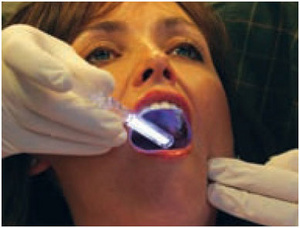 It is an easy, inexpensive and non-invasive procedure which can be incorporated into your regular dental check-up. We charge only £30.00 for this test. Please e-mail,call or ask Retha at the surgery for more information, alternatively you could visit Vizilite using the link on the left, and find out further information for yourself.